What is ventilation and air conditioning? Air pollution control and cosiness at home includes fresh, that is clean air free from carbon monoxide and pollutants, that contains neither too much nor too little humidity and has an agreeable temperature. The systematic transportation of supply and exhaust air is monitored closely by the fans. In contrast to ventilation through windows and leaky building envelopes, ventilation with special systems can be set up to act according to humidity contents and temperature. Automated controllers such as sensors and delay timers are particularly helpful: They do not need human intervention, they turn on automatically, ensuring a precise ventilation process and preventing mould growth. Depending on the model the required airflow and air pressure can be adjusted individually. In order to install the ventilation units in exterior walls, glass panes and shafts we recommend using the accessories our brands offer. Their materials are resistant to temperature, waterproof, easy to clean and pressure-resistant. The following is an overview of our groups of articles. Information about individual technical data is available in detail on each article page. Ceiling fans do not count among ventilation and air conditioning appliances because even though they are moving air inside the room, they do not exchange the air (extraction, fresh air supply). 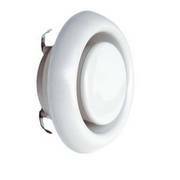 ⮩ Accessories and extras for ceiling fans, e.g. add-on light kits and replacement blades are available in this sub-category. Installing fan units in pipes and ducts that are already present on-site is a a favourable option, because the brickwork is not burdened with new breakthroughs. Disc valves with a gasket ring prevent uncontrolled airflow, given they are properly adjusted to the diameter of the pipe. They are constructed so that the white outer part covers the inlet, thus they are an unobtrusive addition to homes. Protective grilles for end pieces of the pipes keep off rain, snow, hail and insects. Rain water drips off the edge without infiltrating the ventilation system. Transition pieces between lead wire and ventilation system must be airtight, too. For this purpose you will find reducers made of conditioned steel sheet in our shop, they help reduce the diameter of your pipes and allow installation of other attachments. 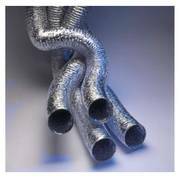 Sleeves in different sizes are designed to serve as connection pieces within ventilation systems. In addition we offer flexible tubes made by CasaFan that can be mounted to your kitchen hood, to name one example. 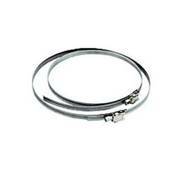 Clips are available in different sizes to help fix the tube and hold them in place. 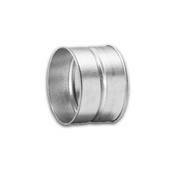 Curved pipe sections and end caps are also part of our range. Depending on the temperature of the transported air, fire safety guidelines might come into effect in case of add-on parts as well. A firewall in domestic kitchens prevents fire from spreading into the ventilation shaft and pipes. 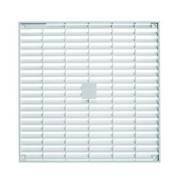 Automated shutters open as soon as there is an exhaust airflow. An integrated spring closes the shutters once the airflow decreases. It is not necessary to connect them to the power grid. The shutters prevent cold air to infiltrate the building from the outside, furthermore they serve as a barrier against coarse pollution and animals. Both aluminium and synthetic models are available. The materials are robust and durable, models of higher quality have soft, insulated fins to promote sound insulation. If the fins are moveable, a distinction is made between horizontal and vertical openings. 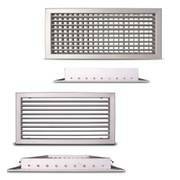 CasaFan’s ALG-D and ALG-O double-row lamella grilles are adjusted to the running direction. Motor-powered shutters for supply and extraction cannot be opened by a strong wind gust, even during rest periods (fan turned off), meaning they provide safety from leaky openings. 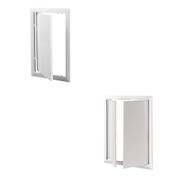 Screened-off grilles are recommended particularly to ensure a consistent air change in damp rooms with closed doors, such as bathrooms or WCs. We offer the most popular colours in our shop, the grilles are simply placed into a cut-out made at the front and back of the door and then screwed together. The stability of a door with 3cm depth and more remains unaffected. WCs and bathrooms are places with different sources of pollution: luckily, smells, steam and cigarette smoke are drawn off by an extractor fan. Combined with a sensor, this process begins and stops fully automated. 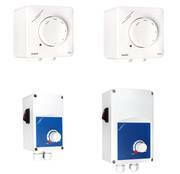 The window fans Vortice Vario 230/9 and 150/6 are turned on and off by pulling a cord. In those cases human intervention is needed, because the user needs to determine when the fan should be operating based on his or her perception. This type of control is the exception rather than the rule, though. Basic fan units are usually connected to the light switch in the room. Another popular choice is to link fan operation to the flush of the toilet. Those methods eliminate any chance to forget switching on the ventilator. They are usually applied in small damp rooms or enclosed rooms without windows. 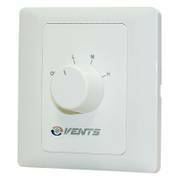 A shut-off delay timer offers you the possibility to adjust the intervalls when the ventilation is happening, a solution that is commonly used in bathrooms or WCs. There are other versions as well that ventilate in certain timeframes, or only once the light has been switched off. For instance, an extractor fan can be programmed to turn on two minutes after the light has been switched off and then operate for five minutes. Fans controlled by sensors are able to orient themselves even better at the current situation in the room. The units in our shop react to motion, temperature, smoke and humidity. 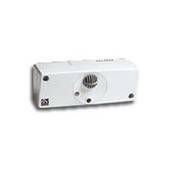 For example if the specified value of steam is exceeded, the fan automatically begins running. That means you do not have to present, ventilation is ensured even if you are at work, on vacation, etc. This is a crucial factor speaking in favour of wall-mounted or window fans. 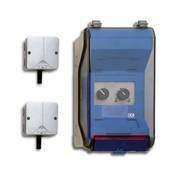 ⮩ Thermostats are ideal for controlling ventilation in professional environments, e.g. production facilities, workshops or warehouses. Several fans can be set up to provide a consistent temperature in large buildings. There are two ways to limit the rotation speed of fan units, either in stages with a step transformer or continuously variable with infinitely adjustable controllers. Transformers are installed like wall switches and give you the possibility to control the ventilation unit on five to six different speed levels. That means you are able to adjust the airflow of your fans to the requirements you have at the moment, also reducing costs for energy and lowering the noise level. 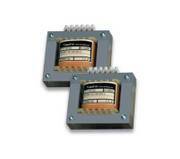 Transformers for installation in switch cabinets are part of our product line as well. Continuously variable controllers allow you to control ventilation units steplessly, irrespective of the speed levels that are already pre-installed in the fan. Motors can be regulated without generating a buzzing sound, on the lowest speed the fan is barely audible. 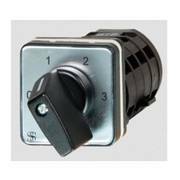 Contrary to conventional dimmers the fan motor is not damaged when using one of these special controllers. Pay attention to the item description where it states whether the device is suitable for application in domestic or professional environments. Depending on the controller unit it is also possible to connect several fans to one regulator. In addition to the mentioned products we offer expendable goods like adhesive tape for sealing pipe joints and leaks in the building envelope. 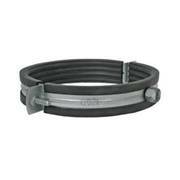 This tape is designed specifically for use in ventilation and air conditioning, ensuring permanent sealing. Furthermore, our range includes helpful extras, such as mounting kits for setting up central ventilation units on ceilings / walls, in-wall boxes and replacement filters rated F5 and F7. Within the range of protective grilles for roof-mounted fans we offer suction grating to prevent touch or cover plates in slate grey or brick-red. 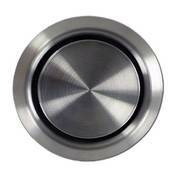 We are at your disposal for all matters relating to ventilation accessories.